Hope you are all well! This week has been baltic and while we are all dying for spring to roll around we are just not there yet! Dressing for the weather is everything in Ireland and it has been so cold lately we just can't give up our coats and scarves yet. This look will hopefully inspire your cold weather outfits. This is a smart casual look with a pop of romantic baby pink for the week that it is! Dressing for colder weather never needs to be dull - and this baby pink coat is such a fab item to have at hand! This is a feel good colour and is so on trend, it is especially ideal this week for Valentine's Day <3! We all have our go-to coat in black, pink or camel shades but why not try picking one up that can add brightness to your looks for the transition between winter and spring. We are coming out of the days of all black, greys and browns and into a much more colourful time. Spring 2018 is going to be all about bright colours, beautiful florals and patterns clashing so you can start preparing by grabbing a beautiful coloured coat. Coat - Carraig Donn (old stock). Scarf - Carriage Donn (old stock). Bag - Pieces (similar here). Chain - Little Hollow Boutique. Have a look at some similar coats here and you can click on the pictures to shop. Shop some similar scarves here. Check out some bags similar to mine here. 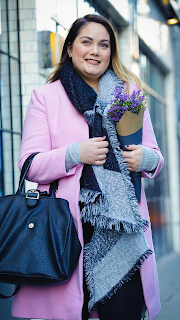 I hope you get some inspiration from this post and don't afraid of colour, i'm such a black girl but every now and then I like to dress up and outfit with a pop of colour, and I am all about be blanket scarves, the keep me so cosy on days like today.